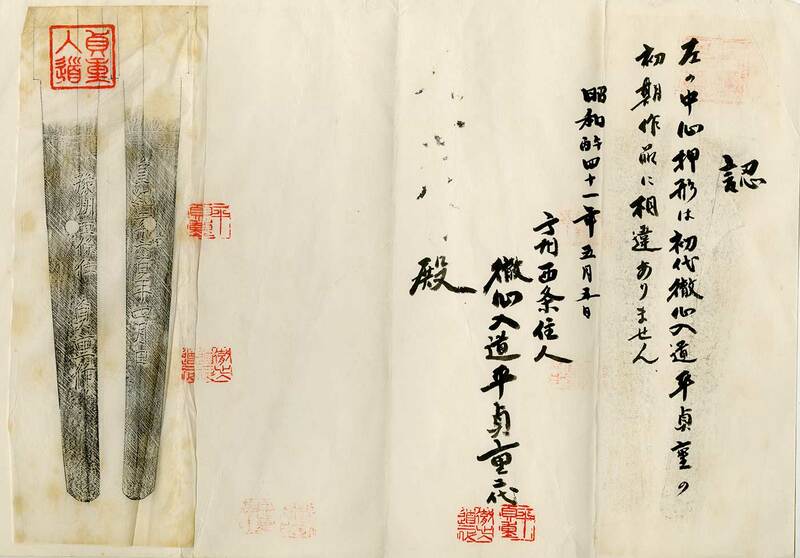 Blade length(nagasa) : 69.8 cm or 27.48 inches. Sori : 2.0cm or 0.78 inches. Width at the hamachi : 3.21cm or 1.26 inches. Kasane : 0.58cm or inches. Era : During world war 2 (1940). with Bo-hi enfraved deep sori and long Bo-shi. and masame hada mixed fantastic nice texture. with long ashi and soft Habuchi. 4th Aichi Saijyo city and real name is Takwshige Imai. human treasure and learned Bizenden mainly. Tsuba: Round shape iron Tsuba, leaves are engraved with open work. Fuchikashira: brass, pine tree is engraved. Menuki: Shakudo, hosetail is engraved with gold color. Saya: Brown cracked pattern Saya. long 69,8cm which was made by special customs order. The Jigane and also Hamon are quite well high ranking sword. We recommend this sword as good investment item in the future. of Norway (North European invasion), and Denmark surrenderd.